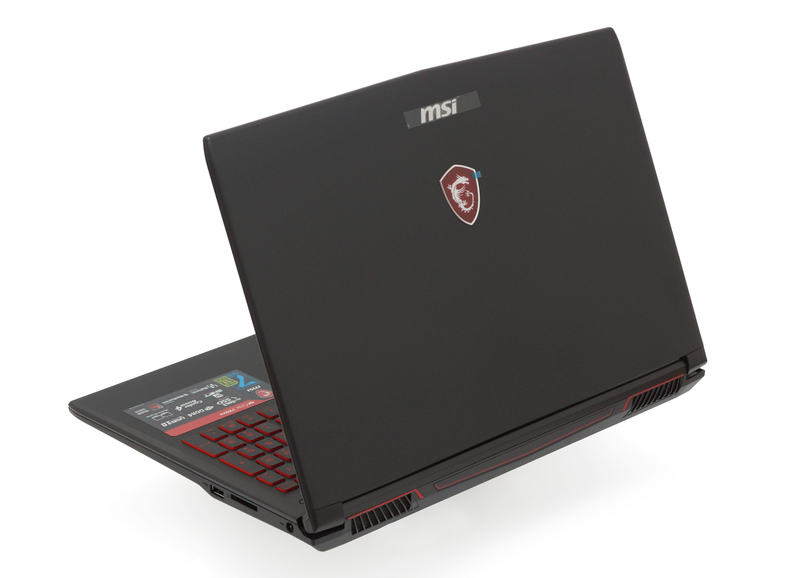 Recently we reviewed a lot of MSI gaming notebooks and every each of them had a distinctive feature that speaks for the device in general. 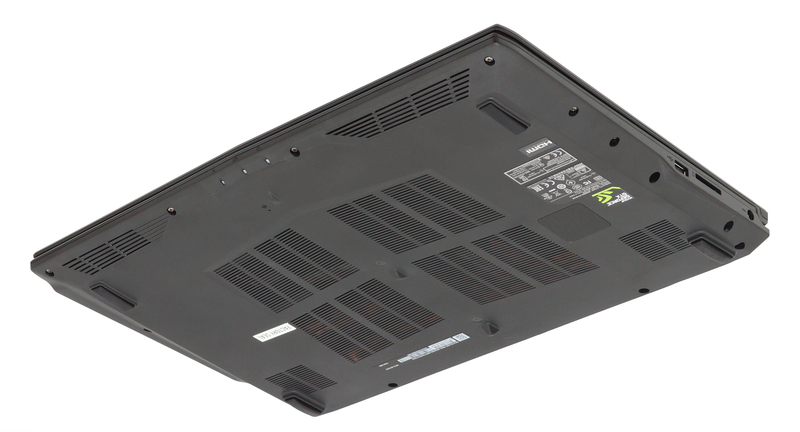 For example, the Stealth Pro (GS63 review/ GS73 review) is chiefly characterized by a super light and thin form factor, while the Raider series adds a better cooling to the equation. On the other hand, GL62M 7RDX doesn’t have anything that particular. It is on the more affordable side and while the company has made some cuts to keep the price down, they also tried their best to provide a good quality product. We are going to discuss a configuration that features Intel Core i7-7700HQ and NVIDIA GeForce GTX 1050 with 4 GB of GDDR5 memory. You should know that if you ever opt to buy a laptop with GTX 1050, you should go for the 4 GB version, even if it’s at the expense of a little slower CPU. This is because modern day games tend to use more and more GPU memory due to the larger size of the textures. Anyhow, the display of choice here is once again a TN panel, branded as an IPS-level, and you’re going to see why in the “Display quality” part of this review. The first thing we see when we open the box is the GL62M 7RDX itself. Underneath it, neatly put inside a cardboard square you can find a bag with some manuals and a driver disk. In the other compartments are located the two parts of the 135 W charging adapter. MSI GL62M 7RDX is built solely from hard plastic. It has a matte paint finish which is a huge fingerprint magnet. We can describe the design as rather incognito, although the surface seems to be pretty hospitable for stickers. This notebook measures at 383 x 260 x 27 mm (15.08″ x 10.24″ x 1.06″) and weighs 2.40 kg (5.3 lbs) – nothing spectacular. 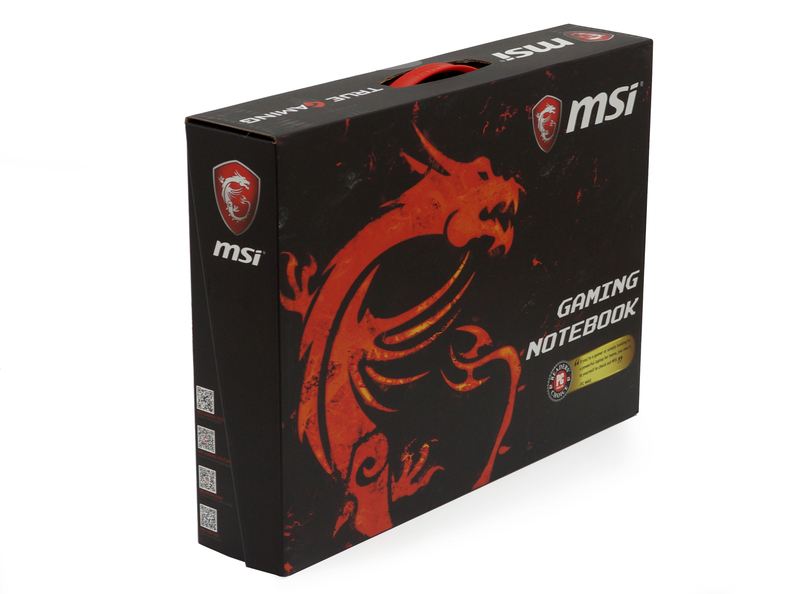 However, we like how MSI has decided to keep things simple instead of reinventing how a laptop should look. Like some other companies… *gasp* Dell *gasp*. The lid of this notebook needs the help of a second hand to get open. This reveals a red painted full-size keyboard. 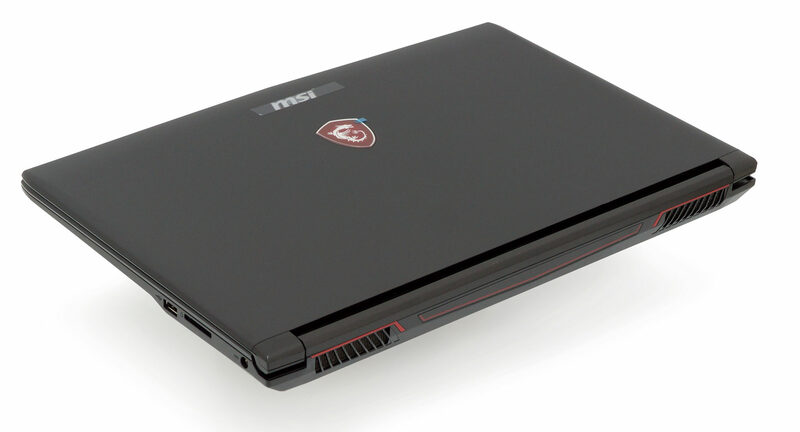 Its backlight is also in the distinctive of MSI red color. It is better for gaming than it is for typing as key travel is long enough but the mechanism is quite soft. On the top right corner of the surface are located those famous three MSI buttons. This configuration is identical to what we saw in MSI GP62M. Underneath the keyboard is the touchpad with dedicated keys. It’s not very large and there is also a thin strip right over the buttons that is not touch sensitive. Aside from the boring look on the surface, on the bottom things get more interesting. A good bouquet of drills and vents provides a peek inside the machine, with all the heatpipes and both fans being visible. Portwise, the left side of the laptop is a bit overcrowded, compared to the opposite one. There is an RJ-45 connector, followed by a USB 3.0 Type-A port and two video connectors in the face of an HDMI port and Mini DisplayPort. Next, we have another USB 3.0 Type-A and one Type-C port. They are joined by two 3.5 mm jacks. While on the right we can see only a charging port, SD card reader, and single USB 2.0 Type-A port. We can say that this is reasonable enough, especially for people who use external mouse quite often. 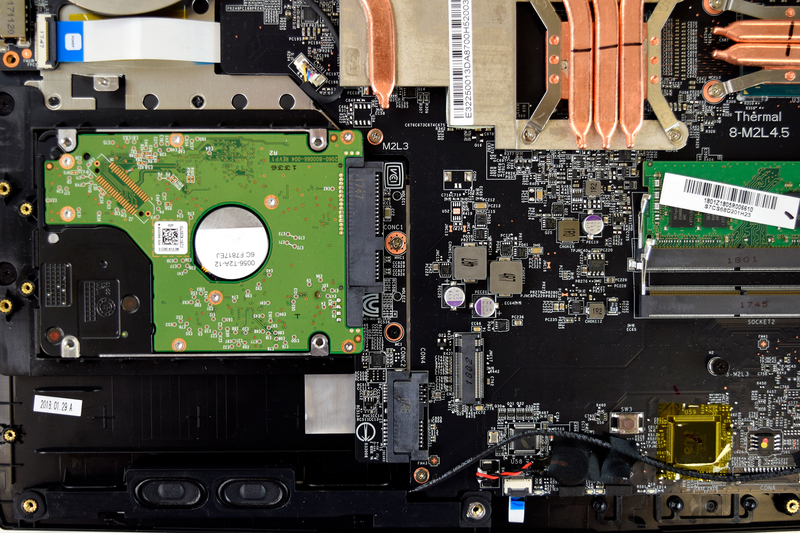 As most MSI devices we reviewed recently, GL62M 7RDX doesn’t offer upgrade through a dedicated service panel, so you need to remove the whole bottom plate of the device. However, this is fairly easy as you “only” need to remove 16 Phillips head screws. We like that all the screws have the exact same size, so you won’t need to lose extra time organizing elements. In the top middle part of the laptop is located the tiny (for this type of notebook) 41Wh battery. As you see from the image below, there is a lot of headroom in terms of GPU cooling. Those three large heatpipes you see in the middle are connected to the GTX 1050. A smart decision was made to separate one of them and send it to the other fan, thus giving the other side more space to breathe. Actually, one would think that this is an overkill for this GPU, but keep in mind that GL62M comes also with the more powerful GTX 1050 Ti and GTX 1060. Here you can see a total of two RAM DIMMs, of which only one is occupied in our unit. You can also have a look at the Wi-Fi adapter, located in the top right part of the image. In the next photo, the focus is on storage options. While it has an M.2 slot that supports NVMe devices, our unit is only equipped with a 1000 GB HDD, rotating at 7200 rpm. 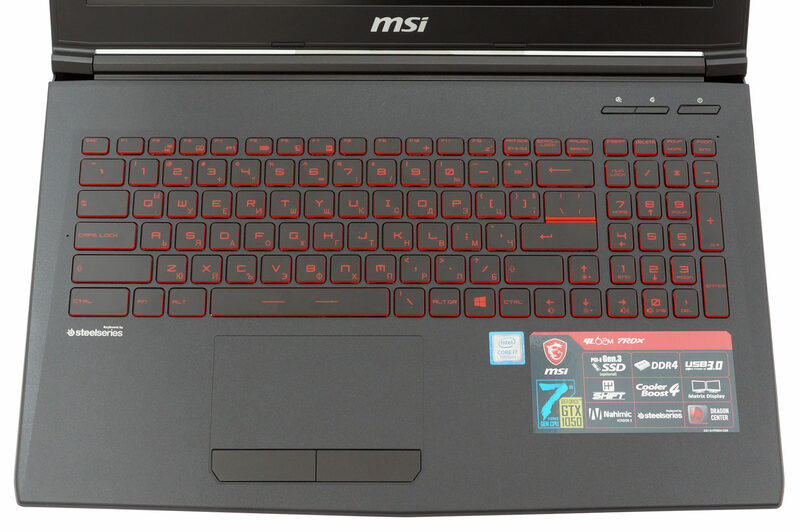 MSI GS63VR 7RF is equipped with a Full HD (1920×1080) TN panel with 15.6-inch diagonal, 0.18 x 0.18 mm pixel pitch and 142 ppi. 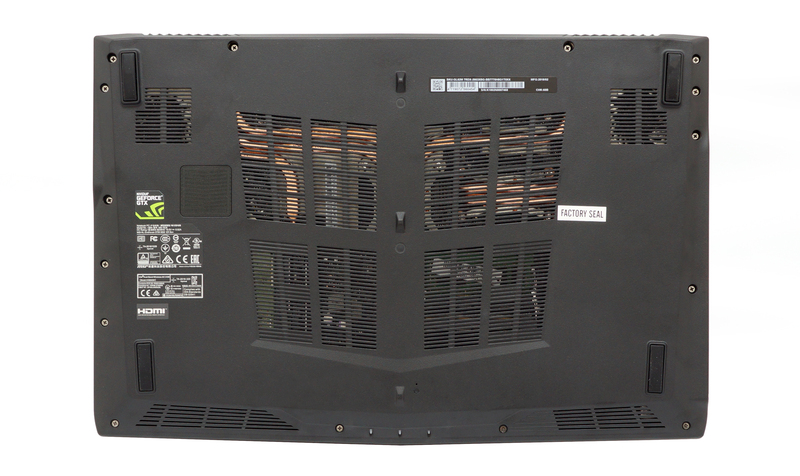 The panel has a model number N156HGA-EAL and can be considered as “Retina” when viewed from at least 60 cm. As can be expected from a TN panel, viewing angles are poor. This panel is relatively dim as the peak brightness we recorded was 230 nits in the center of the screen and 311 nits as an average across the surface. Maximum deviation is 13%. The correlated color temperature at maximum brightness is colder than the 6500K sRGB standard – 7340K. Furthermore, at the grey scale temperatures are even colder – 11000K. However, this can be corrected by our profiles. You can see how these values change at 140 nits (56% brightness) in the image below. Still, we’ve included other color spaces like the famous DCI-P3 standard used by movie studios, as well as the digital UHD Rec. 2020 standard. Rec.2020, however, is still a thing of the future and it’s difficult for today’s displays to cover that well. We’ve also included the so-called Michael Pointer gamut, or Pointer’s gamut, which represents the colors that naturally occur around us every day. This screen appears to be appropriate for gamers at it can display every color, found on the Internet and HD TV. It also covers 96% of the DCI-P3 color gamut, providing punchy and saturated colors. 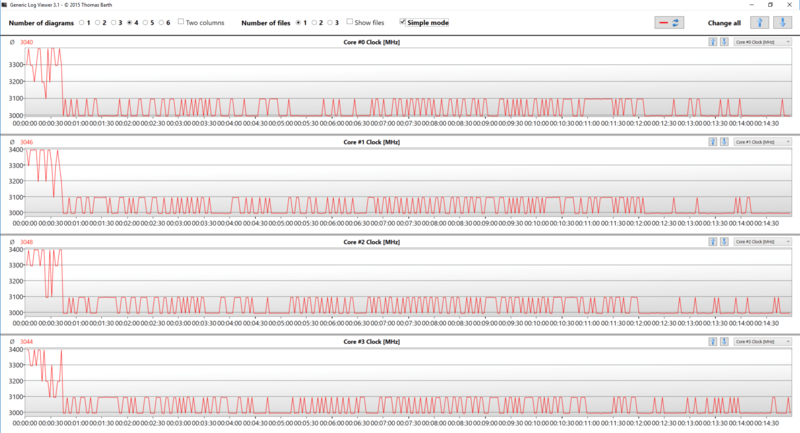 There isn’t any serious PWM-adjustment here. The display uses this technology to control brightness levels up to 60 nits and moreover, it does it at high frequency, thus being not particularly harmful in this aspect. 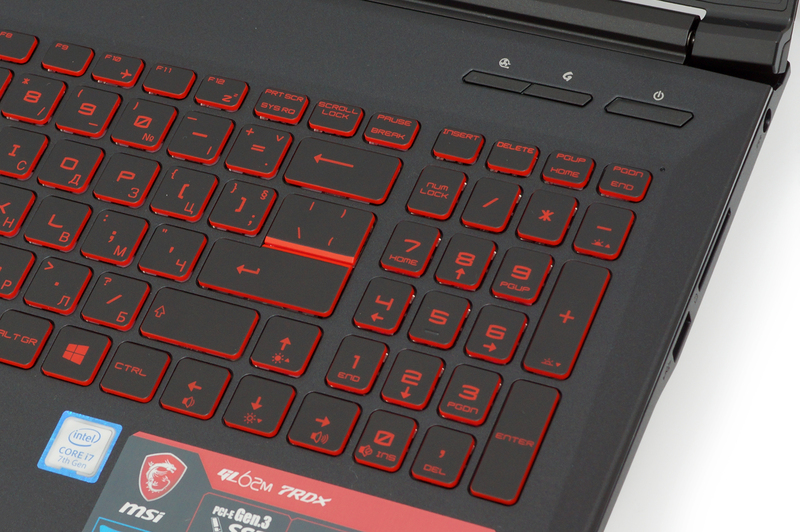 MSI has equipped GL62M 7RDX with a typically gaming display. It has its bright sides, but also some setbacks. While the color coverage spreads to DCI-P3 territories with 96% of colors being able to be reproduced, it has a poor contrast ratio, which takes a bit from the eye candy. And although PWM-adjustment is not particularly harmful (you can get rid of it with our Health-Guard profile) Luminance uniformity is not quite good at the same time. In addition to that, viewing angles are poor, but we have to note, that almost every drawback of this screen shouldn’t bother gamers. MSI GL62M 7RDX sounds well and loud, with low, mid and high frequencies being clear from severe noise. As always, the battery tests were run with Windows power saving setting and Wi-Fi turned on, and the screen brightness adjusted to 120 nits. This device is equipped with a 41Wh 6-cell battery. Our tests concluded that this battery is insufficient for a laptop of this type. Although you can get around 4 hours and 22 minutes of web browsing and a little over 4 hours of video playback, there is one thing that is most setting back – merely 30 minutes gaming on battery power. 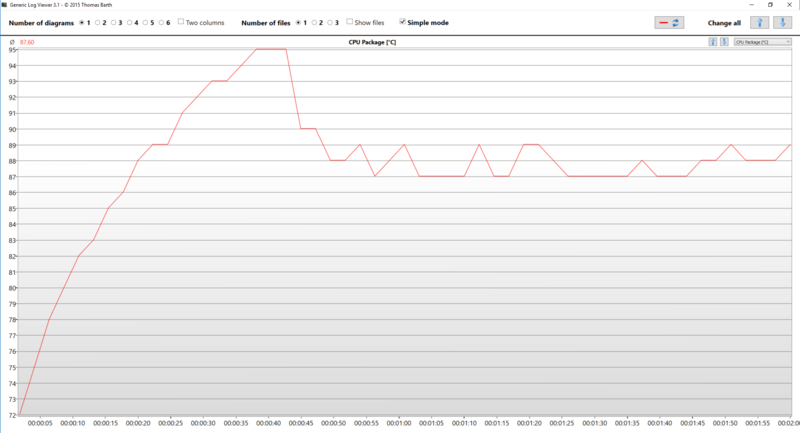 However, this is probably due to not very good optimization and we think that future updates are going to fix that. 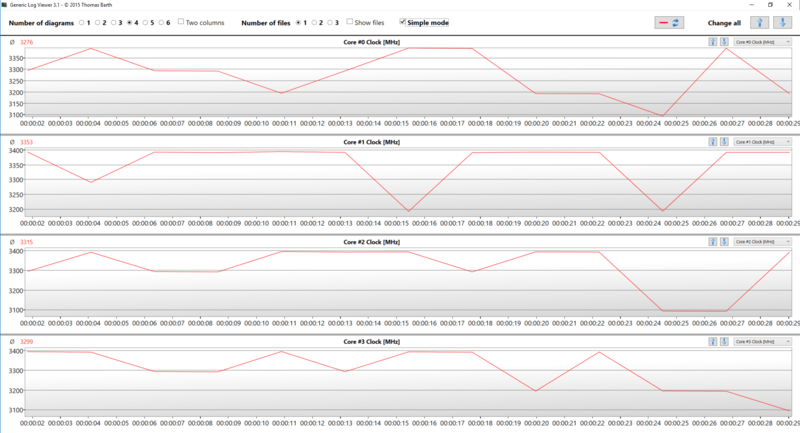 Here you can see an approximate comparison between the CPUs that can be found in the MSI GL62M models on the market. This way you can decide for yourself which MSI GL62M model is the best bang for your buck. Here you can see an approximate comparison between the GPUs that can be found in the MSI GL62M models on the market. This way you can decide for yourself which MSI GL62M model is the best bang for your buck. MSI GL62M 7RDX with a GeForce GTX 1050 manages to get some good framerate even in Full HD resolution and medium eye-candy. In GTA V we saw respectable minimum fps as the GPU never got tired, nor too hot, thus performing homogeneous. However let’s not forget that we’re on the budget side of gaming here, so titles like Tomb Raider won’t be very playable at high graphics settings. We measured an idle temperature of 41°C of the Core i7-7700HQ of this unit. In the first 30 seconds of testing under extreme load with Prime95 we notice the frequency being relatively stable around 3.3 GHz. Meanwhile, temperatures were rising steadily and at the end of the first checkpoint they hit 92°C. Temperature growth transitioned into second checkpoint territories as they reached 95°C, which resulted in clock speeds dropping by 400 MHz for each core. 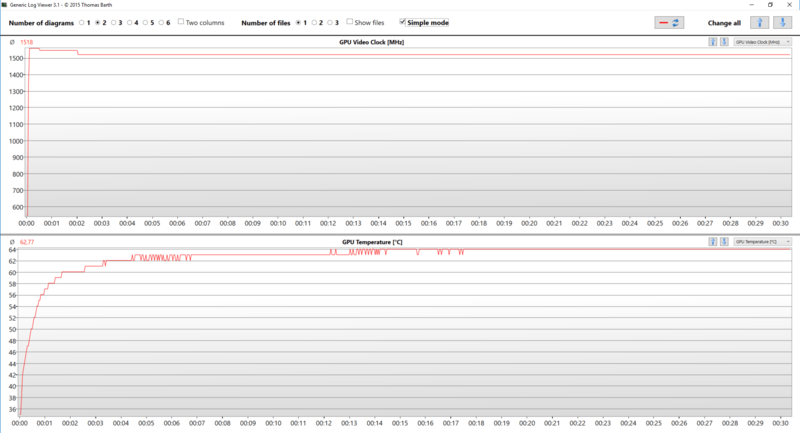 After that, we saw fluctuation of the frequencies between 3.0 and 3.1 GHz. 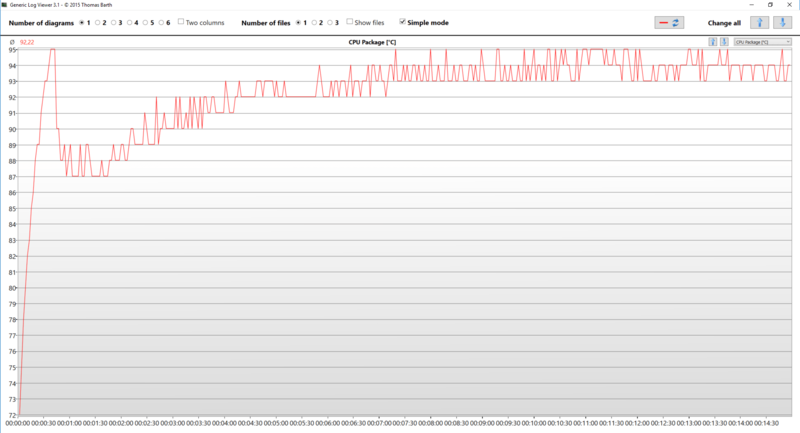 That fluctuation continued until the end of the test, hence the average clock speed is around 3.05 GHz. However, temperatures grew even further, reaching the former highs of 95°C. This is quite hot and keeps in mind that all our tests are conducted at a room temperature of around 21°C. However, Prime95 tests the components under extreme conditions that are unlikely to happen in real life, so don’t worry. Although CPU temperatures were pretty high, we saw something quite contrary with the GeForce GTX 1050. 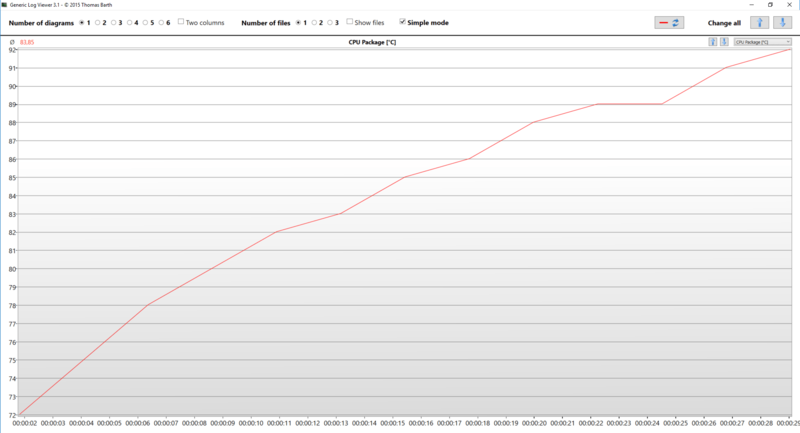 Not only the maximum temperature it reached was just 64°C, but the GPU clock speed never fell under 1500 MHz. It’s interesting because the actual maximum boost frequency should be 1493 MHz. This assures that you get 100% (and even more) performance out of the GTX 1050. Surface temperatures were reasonably warm. There was some heat in crucial places like the middle of the keyboard and surprisingly – the touchpad. Of course, they won’t burn you, but keep in mind that it’s going to get quite warm on your hands. There are a lot of budget gaming devices on the market these days. Be they the popular faces of Lenovo Legion Y520 and Dell Inspiron 15 5567, or some lowkey newcomers like the facelift Nitro 5 with the brand new AMD combo. The MSI GL62M 7RDX offers a lot for the money, while keeping the design neutral, if not boring. 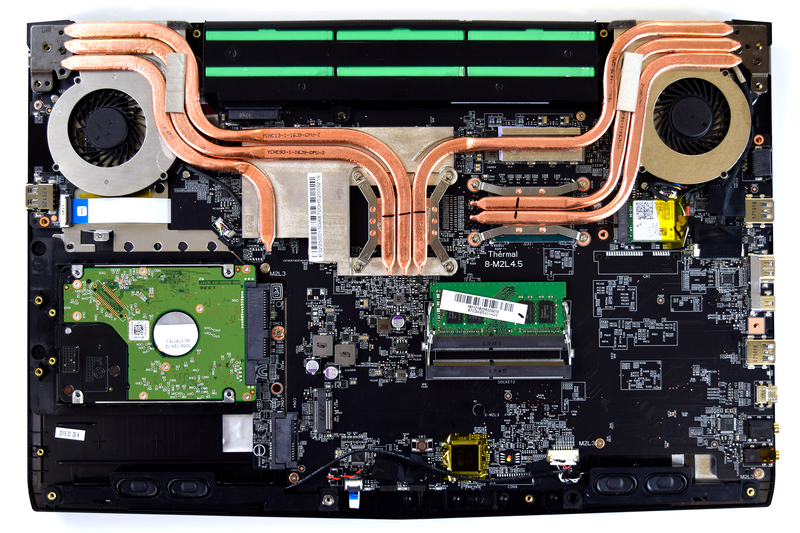 Of course, there is a lot more than performance that defines a gaming notebook, but that’s a good starting point. 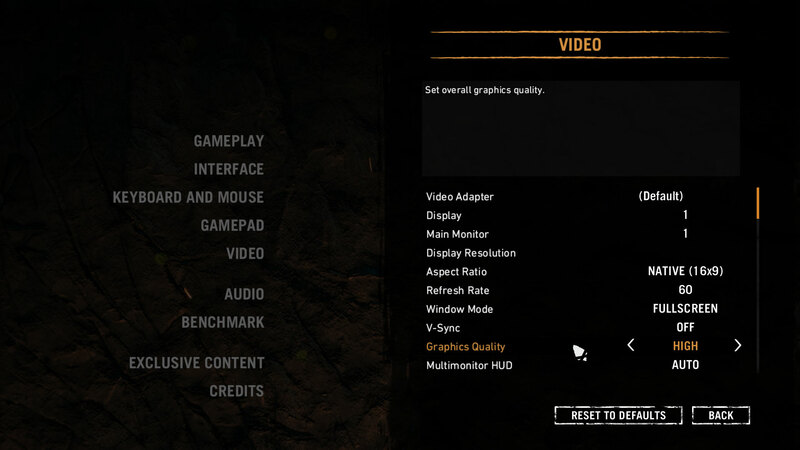 We also like that there are upgradeability options right out of the box. First, there are two RAM DIMMs that support up to 32 GB of memory and on the storage side, we have an M.2 slot that is NVMe enabled. 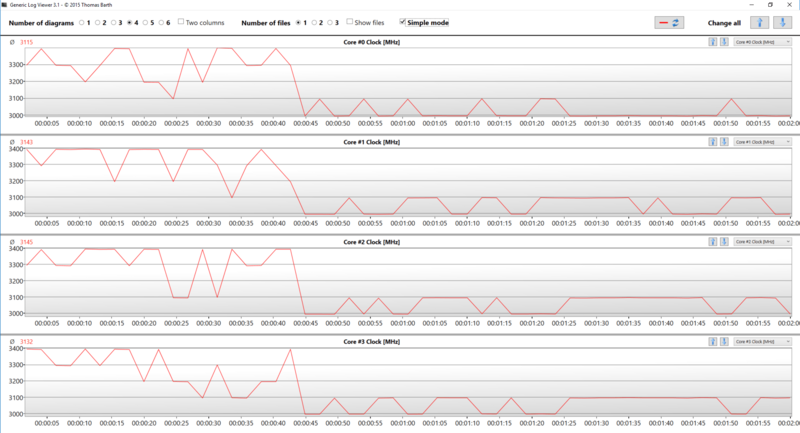 On the other side, if you don’t need that fast storage, you can just settle with an HDD, like the configuration we used. Now we move to the most controversial part of this gaming notebook – the screen. While the company offers IPS screens, the cheaper choice will be a TN panel, branded as “IPS-level”. Beware of that by the way, because there are a lot of retailers that falsely mark the TN panel as an IPS one because of that door left open by MSI. Anyhow, this screen is a jewel for gamers as it is relatively fast and reproduces 100% of sRGB and 96% of DCI-P3 color gamut. Sadly it comes with some setbacks like poor color accuracy and cold color temperature (both fixable by our profiles). Also, we can’t overlook the poor viewing angles and mediocre contrast ratio. Another feature we think MSI could have done better is the battery performance. It’s both too small (41Wh) and has terrible optimization as we got a hair over 30 minutes of gaming on a single battery charge – horrendous. Web surfing and video playback times were not very impressive either at 4 hours and 20 minutes and 4 hours and 5 minutes respectively. In this area, the GL62M is humiliated by the Acer Aspire VX 15 that offers around 3 times more battery life when gaming. Tell us in the comments what your thoughts on this device are. Do you prefer slightly better performance or you’d spend your money on something with a bigger battery potential?